Natural herbal defense for effective breathing, oxygen transport, immune system and digestive tract. Echinacea, eucalyptus based. Dosage: 8cc per gallon of water 3 times per week. Made by RopaB. Treatment for respiratory infections. Especially effective for upper respiratory infections, dissolving mucous. Treatment for respiratory infections, mycoplasmosis, ornithosis. Flock treatment in the water. Treatment for chronic respiratory infections. Each tablet contains 10 mg of erythromycin. Dosage: administer 1 tablet per bird per day for 12 days. Individual treatment for respiratory infections. Each tablet contains 15 mg of Doxycycline and 1 mg of Broomhexine HCI. Dosage: Administer 1 tablet per bird per day for 3 - 12 days. Dosage: 1 tablet per bird per day for 5 - 10 days. Individual treatment for respiratory problems. Dosage: 1 tablet per bird, every day for 5 - 10 days. Combination of 2 respiratory treatments. (10% doxycycline and 500,000 j.m per g. colistyn). Dosage: 1 teaspoon per gallon of water for 3 - 5 days. Combination of 7 mg doxycycline and 25 mg tylosin (tylan). Effective individual treatment for respiratory problems. Dosage: 1 tablet per bird per day for 7 days. Combination of tylan (tylosin) 20 mg and amoxicillin (10mg) in tablet from for individual treatment. Effective against bacterial and respiratory problems. Dosage: 1 tablet per bird a day for 5 days. In severe cases, 2 tablets per day for 5 days. Combination of tylosin (20 mg) and amoxicillin (10 mg) powders. Use to treat a wide range of bacterial and respiratory infections. 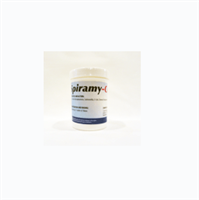 Combination of 2 respiratory treatments - doxycycline (20 grams) and tylosin (5 grams). 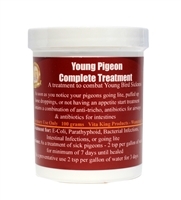 Treatment of avian mycoplasmosis, salmonella, E-coli, chronic respiratory problems. Contains colistine 100,000 j.m / 130,000 j.m Spiramycin. To use: 1 teaspoon per gallon of water for 3 to 5 days. 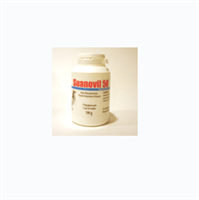 Highly effective water soluble treatment for respiratory problems. During race season: use 2nd and 3rd day before shipping, 1 teaspoon per gallon of water.